At least 100 pooches — with owners in tow, holding leashes — marched near the Louvre in Paris, at a demonstration to demand more park space and access to public transportation for the four-legged friends. PARIS — Some Parisians want just a little bit more of their city to go to the dogs. At least 100 pooches — with owners in tow, holding leashes — marched near the Louvre at a demonstration to demand more park space and access to public transportation for the four-legged friends. Tongues and tails wagged Saturday under a warm Paris sun as collies, pugs, boxers, bulldogs, Labradors and other breeds paraded around the famed Paris museum. 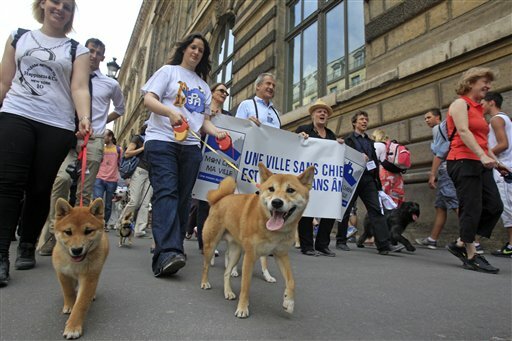 Organizers of the canine-citizen march dubbed “My Dog, My City” estimates about 200,000 dogs live in Paris. They say other cities like New York, London, Montreal and Brussels offer more dog-oriented public spaces. According to the city’s Web site, two of Paris’ 20 sections have only one reserved public park space for dogs. Leashes are required.